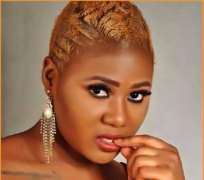 Salam Munim is not happy that she is rumoured to be bleaching her skin to catch the attention of producers, she has always gotten the lead roles in movies, and it is believed that her light skin is what lands her these roles that a lot of dark skinned actresses fight over for, she has debunked such claim and said she is confident with her body and skin tone. Salam explains: ” I will not bleach and I have not bleached. I am confident with my body and skin tone and I like the way I look”, she said.“I admit being light skinned is nice because it gives you some confidence but bleaching is not good because of the damage it causes the skin. Moreover I don't need to be light skinned to get roles. I know my capabilities and movie makers I have worked with can attest to that” she said.